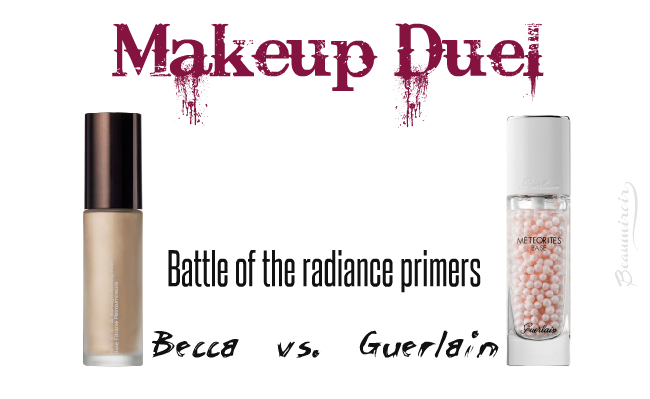 Makeup Duel - Radiance Primers: Becca vs. Guerlain! 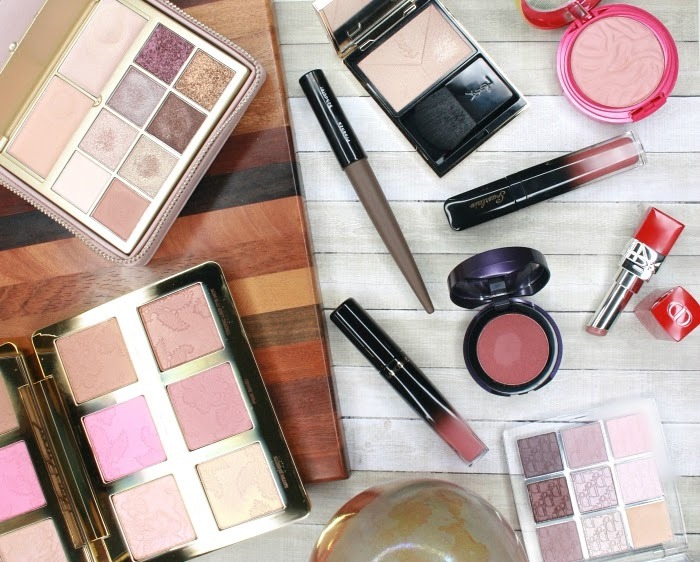 This year, in the marvelous world of makeup, it's all about the glow. 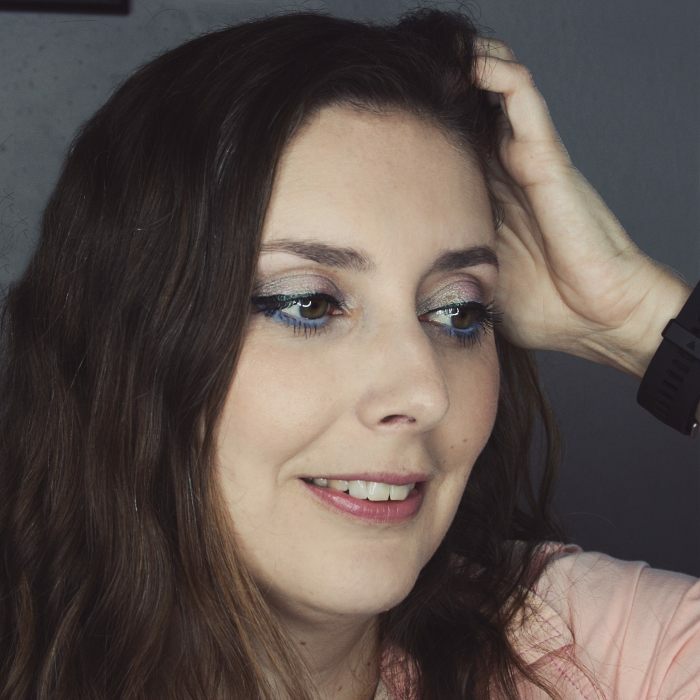 Internet celebrities bathe in highlighter, and even for us real people skin is expected to look youthful, dewy and radiant. Many of us don't have flawless, glowing skin naturally, so we have to turn to makeup to add radiance to the face. A good way to do that is to use a luminous primer: because it sits under foundation, the glow it provides should be a little more subtle and natural than the wet-looking dewy foundations. I have tested two radiance primers in the past few weeks: Becca Backlight Priming Filter, that I got as a deluxe sample in my June Sephora Play! box, and Guerlain Météorites Base Perfecting Pearls, after I was given a sample at Saks 5th Avenue in New York. Becca's primer is a recent release that's been quite popular in the past few months, while Guerlain's priming pearls are a newly reformulated version of an old classic, launched for spring this year. I tried them for about a week each and one day I also applied both, each to one side of my face, so the differences would be easier to notice. Based on the brands' descriptions I expected the two primers to be very similar, since they have the exact same purpose: to make the skin more luminous and radiant. It turned out that they were quite different! But how do they compare, and which one is the best? Let the fight begin! "creates a canvas for your makeup, extending its wear from day to night. Infused with three unique Filtering Luminescent Pearls, each one adds a different drop of diffused light. Blended together, they impart a one-of-a-kind, lightweight, whipped fluid that creates a smooth canvas and acts as an instant filter, while the vitamin E-enriched formula minimizes the appearance of fine lines and wrinkles. Backlighting acts as an instant filter, creating a diffused, soft-focused radiance that allows your complexion to catch light for a glowing look. Infused with Becca’s proprietary blend of crushed pearls, this primer achieves a lit-from-within, healthy-looking effect." 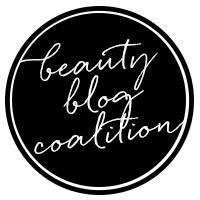 "smooths and color-corrects your skintone for a radiant complexion. Infused with a delicate violet scent, it’s formulated with Guerlain’s signature Stardust Technology: a unique complex encapsulating a celestial powder that transforms light invisible to the naked eye into visible and soft-focus perfecting light to blur imperfections and provide exceptional radiance. The fresh gel texture melts with the rosy pearls to give skin a radiant and glowing finish, while neutralizing excess sebum for a long-lasting matte complexion. Highly concentrated pearls containing multi-colored, micro-shimmer particles amplify light reflection to create an illuminating, color-corrective light for your complexion. The absorbent powders neutralize excess oil while a special polymer helps to fade imperfections and smooth fine lines for a long-lasting, matte and even complexion." As you can see, both promise soft-focus luminosity and radiance as well as minimized fine lines, but Guerlain also claims that its primer absorbs excess oil, color-corrects and blurs imperfections. Since I only have samples of the primers, I'll have to show you stock pictures. I have seen them in stores, and both come in beautiful, hefty glass bottles. Guerlain's Météorites primer consists of little pearls of pale pink powder suspended in a clear gel. Of course these pearls are reminiscent of the classic Météorites Pearls Powder, an iconic product by Guerlain - hence the name of this primer. It's really beautiful in its bottle, it looks more fun (hello, popping pink pearls!) and at the same time more luxurious than Becca's. Guerlain definitely wins this round for the unique and unusual presentation! This one is going to be quick and easy! The primers both come in 1 oz bottles, but Becca's retails for $38, while Guerlain's sells for a cringe-worthy $74. No, that's not a typo! They're really quite different! Guerlain's Météorites primer is a lightweight gel that feels very fresh upon application, while Becca's is thicker and creamier, with a consistency that reminds me of lotion. 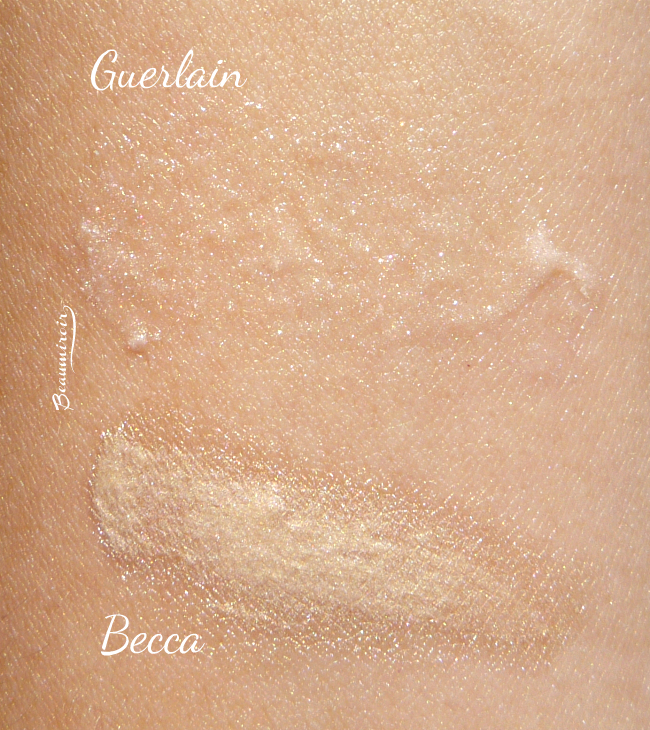 I find Guerlain's easier to spread allover the face, and although Becca's is more hydrating, right now in the summer I much prefer the refreshing gel texture. My foundation also glides more easily on top of Guerlain's Météorites primer. Both primers are quite heavily scented, so if you can't stand fragranced products neither would be a good pick for you! To my nose Becca's smells like a citrus-vanilla mix, while Guerlain's features the classic violet fragrance that all of the brand's face products are scented with. Both scents are pleasant, but I find Becca's a tad heavy (I'm not much of a vanilla fan) and I've known and loved Guerlain's violet scent for decades. Guerlain wins this round! 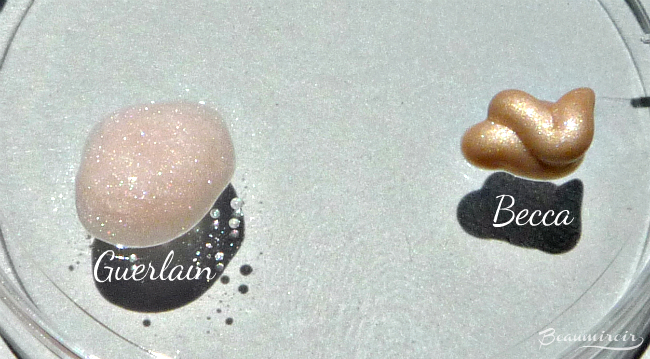 - Guerlain's Météorites primer is a sheer gel with a good amount of tiny pink sparkles floating around. Guerlain says that the reflective particles are "multi-colored" but I can't see that. To me they're just pink and maybe white/silver. 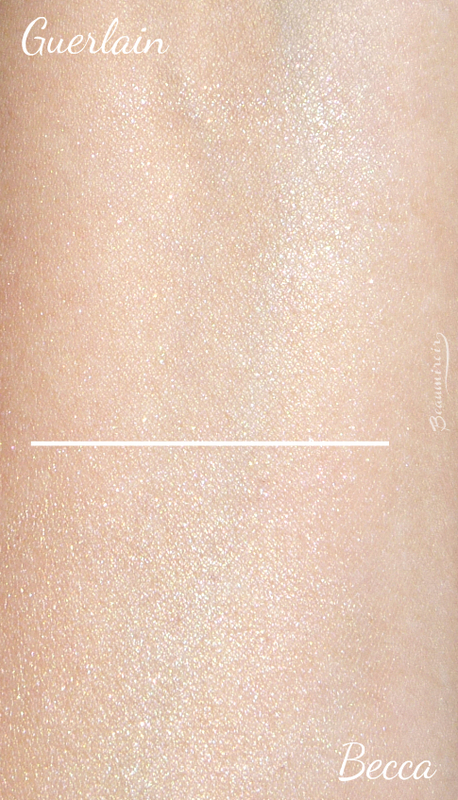 Once spread over the skin, the base disappears but the shimmer reflects light in a way that adds luminosity, without looking disco-ball sparkly. I wouldn't say that this primer color-corrects as Guerlain claims, but it does blur imperfections a little bit. - Becca's Backlight primer, on the other hand, is like liquid shimmer. In fact I find it very similar to the brand's liquid highlighters I have tried. You can't see where the base starts and where the sparkles begin, it's just one creamy fluid in a champagne shade saturated with micro-shimmer. It's a lot more opaque, so a little goes a long way. Once applied it has a pearl finish that makes your skin glow. 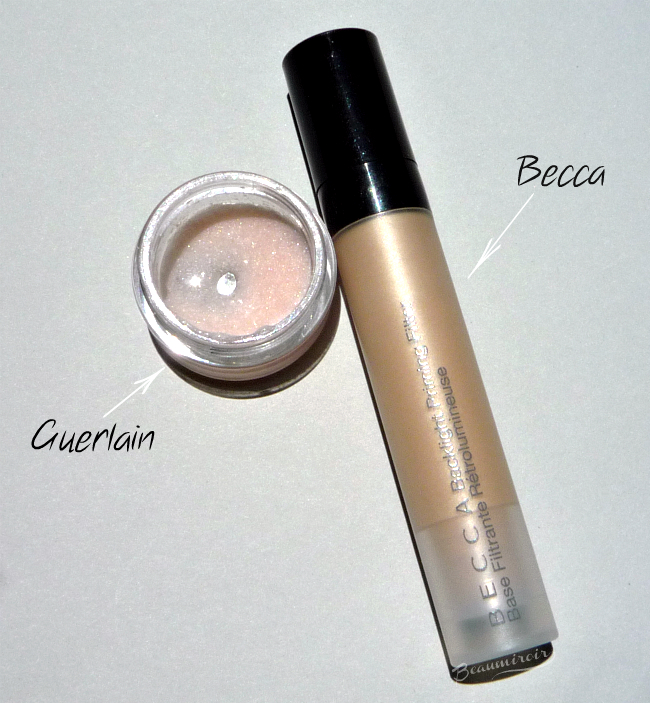 So to me, Guerlain's primer is more luminous while Becca's is really glowing. The glow may sound like it's exactly what you want but... there's a but. First, this frosted finish emphasizes my pores and skin texture quite a bit. I really don't see the line minimizing effect that Becca claims here. And even more problematic, Becca's Backlight primer makes my combination skin look very oily. Right after application, it looks a bit too dewy, but as the day goes by, my skin starts looking like a major greasy mess. Not just on the T-zone, where I usually have minor shine, but everywhere I've applied it. My husband actually asked me why I had a sweaty face once! Guerlain's Météorites primer doesn't make me look oily at all. The luminosity it imparts looks very natural, as if it was breathing life back into my dull skin. I wouldn't say that it controls excess oil despite the brand's claims, but at least it doesn't make things worse. My skin gets a bit shiny on the T-zone by the end of the day just as much as it normally would. Because it's less moisturizing it doesn't help with any dry patches I can have, but I don't find it drying. Someone with dry skin might enjoy the glow from Becca Backlight more than I do, but for combination, oily, and probably even normal skin in the summer, its dewy finish is too frosty and ends up looking oily. Point goes to Guerlain for the natural luminous finish! that they will look a lot more subtle once covered with foundation. Becca's primer making my skin so much oilier, it's no surprise that it causes my foundation to break down and disappear faster than normal. A bit disappointing for a primer to say the least! I don't think Guerlain's primer does a very good job at prolonging wear. I didn't notice that my foundation lasted any longer than usual. But at least it didn't make it fade faster than usual! If you have combination to oily skin and you're looking for a primer that will give you a natural, radiant look, I strongly recommend Guerlain Météorites Base Perfecting Pearls - that is, if you can fork out the $74 it costs... I would only recommend Becca Backlight Priming Filter to people with dry skin, under a full coverage, very matte foundation, or to use on the high points of the face as a highlighter rather than an allover primer. Have you tried either of these primers? What did you think?